There are loads of forums on the internet today, ranging from about every kind of niche you can think of, many forums of which are to do with web design / graphic design. Some stand out, and others don’t. We decided to make things easier for you and search for the best forums for web designers. Having a great, friendly and knowledgeable community. The users need to be active (sign on daily / every few days). Needs to have a very targeted user base. In other words, most of the members need to have signed up to be members and become active in the community, not just sign up to gain access to a few things, not post, then forget about the community entirely. We could be here all day listing off factors. Of course, the forum needs to have a decent amount of traffic so designers get heard, and it needs to have a user-friendly design so web designers can use the forum with ease. Anyway enough talking, here’s the list of 10 forums web designers must know about. #Launch is a community of designers, developers, entrepreneurs, and marketers. Its homepage boasts of members who are “Y-Combinator founders, entrepreneurs, and investors. #frontendDevelopers is a great place to find new gigs. You can also get feedback from other developers, learn the latest trends and share ideas. CoffeeCup Software was started in 1996. 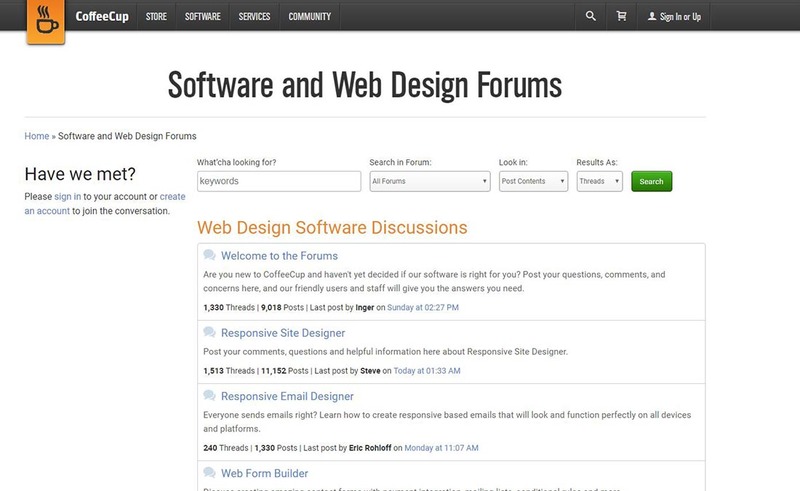 The forum helps web designers create better websites. Designer Hangout is a great web designers’ community and you can join 9,700+ UX designers and researchers from around the world to discuss user experience in the UX Slack community. This forum may not be just about web design, but it has one of the largest forum communities on the internet with over 290,000 registered members! You can buy, sell and trade services on there, so it’s the perfect place for web designers. You can also pick up a lot of work on there, and clients too! This forum has a really nice simple layout, and their forums are always buzzing with new threads. They have many forum categories that are split in to more a less everything you can think of. They cover web 2.0, graphic design, flash, illustration, advertising, marketing, typography and much more. Although this forum is hosted on a .co.uk domain (it doesn’t mean it is just for UK people), and even though they only have around 10,000 registered members (compared to some big boy forums), they have an awesome community for web designers. Their forum categories cover all aspects of web design and I love the header design on their website. This forum covers web design and other webmaster aspects such as promotion and search engine optimization. Their nice simple forum design is very easy to navigate round. They have nearly 90,000 registered members, and there are always people online. This forum is insane! All web designers must be registered at this forum! It’s simply beautiful! They have a small user base of around 11,000 members, but there are always web designers online. 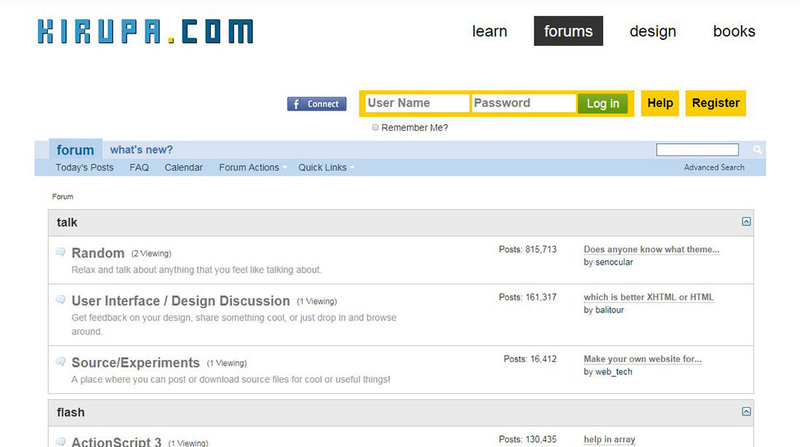 Their forum covers many aspects of web design, and it’s worth checking out. Now Kirupa is usually for flash design and development, but as the years have gone on they have extended their forums to cope with web design. You can post your designs for critique, and you can also talk about HTML, css, and styling web design. Some of these links are broken, why not replace one of them with a new forum that’s centered around the same subjects? https://pixelforums.net is an art and photography community that covers a wide variety of topics. Thanks a lot for sharing these very nice and useful designing websites with us. As I am related to website design field, it will help me a lot. Thanks once again for sharing!!! This is a useful list. I see it came out 3 years ago, are there any forums that you would add as of 2013? Added some of them to my favourites. I actually registered all of the forum lists you have provided and I found a very useful forum sites man.. Thanks! Great list of forums. This site also very useful for newbie web designers. Thanks for the list, it is very helpful. However, it is important to know whether it is a do follow or a no follow links forum. It does matter, as most of the people investing their in commenting is for getting quality back links to their site. If that does not happen, there is no point wasting your time there. nice list of forums, i will check them out. Nice list; a shame that you didn’t include http://webprocafe.com as we are a really friendly bunch and have a great community. If you have time to update / review this list then maybe we can be included. this very useful to me..thanks for posting…. Good list of forums here. I’ve been to a few of these but I’ll have to check out the rest. Thanks for sharing this list. Can you add some more please? or provide link. Maybe in our next post. Nice List of related forums. It is also a forum based web site that have discussion topic surrounding anything about design. 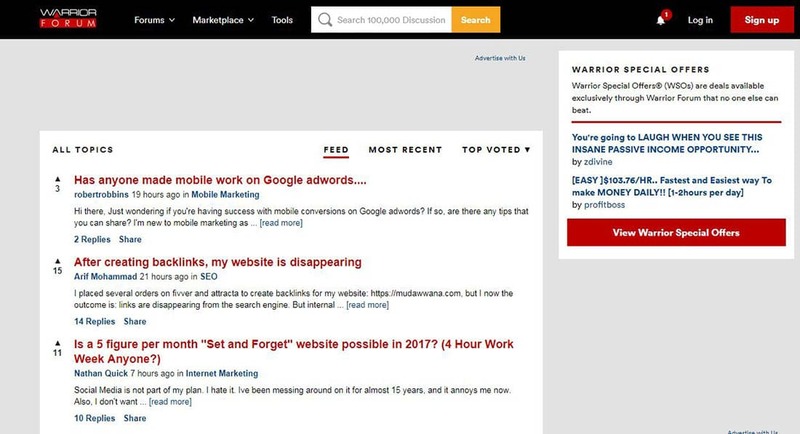 Don’t forget about Sitepoint. Its an extremely active forum. Hmm, If you have any tutorials on your forum i could add you to the next list perhaps? What a great list! I’m already on a few of these, but the smaller forums are especially helpful to know about. Great opportunities to connect (and vent 😉 ) with others in your industry.